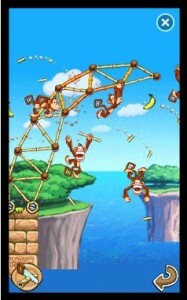 Building bridges and towers made out of bamboo generally doesn’t sound very exciting. 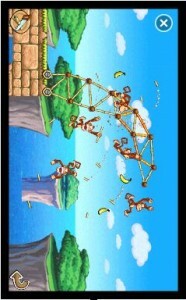 When you add monkeys to the mix, things always get a bit more entertaining. 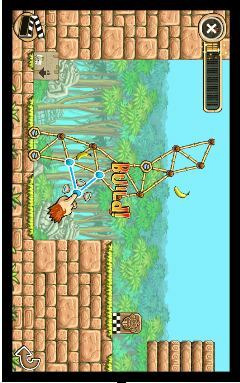 Enter Tiki Towers, Build using only bamboo as your tool to help not only the monkeys get to the other side but help them get bananas on their way there. The game looks great… From the moment you first press on the icon to play you get the feeling that it is a quality game. The graphics are better than what I expected of this type of gameplay. The animation is quite a treat as well. 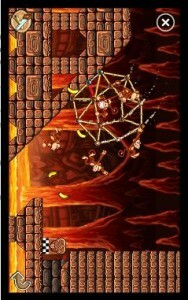 Everything looks clean, alive and just completely finished. 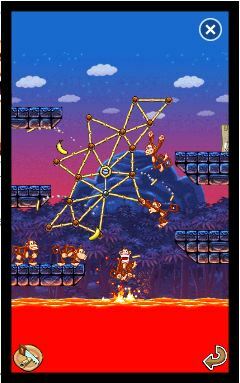 Tiki Towers levels are separated into 6 ‘islands’ and each island has 9 puzzles. To complete a puzzle you must get all of your monkeys safely to the goal. 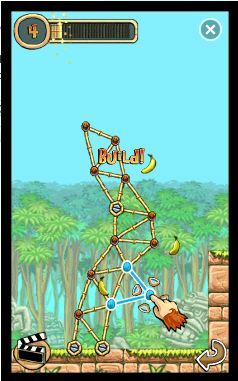 To get a gold seal on a puzzle you must do that and pick up a banana for every one of your monkeys on the way to your goal. 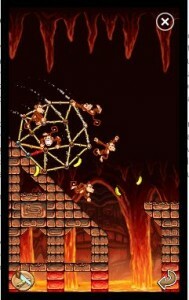 This adds a much needed difficulty level to the game. Another awesome thing about this game is that the AI is amazing. Even after the monkeys have made it to the goal, if there was a banana or 2 left if possible they will try and go back to get them. 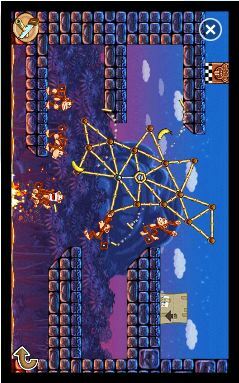 This really adds to the game because it makes you feel like you and your monkeys are working together. I have really enjoyed my time playing this game and am looking forward to going back and finishing some levels thatÂ I have missed or didnâ€™t complete it with a gold seal. At times the game might seem a bit simple atleast maybe in the first 2 islands but it does toughen up especially if your goingÂ for a perfect score. 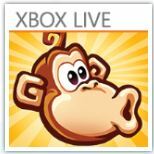 This game is a great pick emâ€™ up and play game and itâ€™s a great addition to the Windows Phone 7 Xbox Live library. Written by: Hyde13 on February 22, 2011. Last revised by: WP7 Connect on February 26, 2011.